EFBs Land at Ameriflight….and We’re Pumped About It! The wait is over! 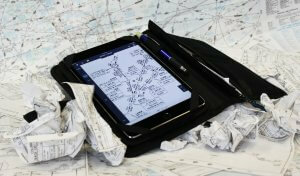 After a roughly one year process, Ameriflight is headed paperless in the flight deck. Electronic Flight Bags, or EFBs, are officially being rolled out company wide. The EFB is a one stop shop for many of the tools and resources pilots need on a daily basis. Traditionally, things like charts, weight and balance, and aircraft maintenance logs have been done on paper. But with EFBs, Ameriflight pilots can say goodbye to all that paper and hello to iPad Mini 4s. Stephen Graham, North East Region Chief Pilot, played a big role in getting the EFB Program rolled out. Implementing a large program like this is no easy task. It takes time and continuous work from many departments to make it happen. “After a lot of planning, the process officially started in the spring by informing the FAA of our intentions to apply for OPS Spec A061. We then did interference testing on the iPad Mini 4. Once the FSDO was satisfied with our results we were issued A061 on a trial basis only. Our first test groups were PDX, SLC and SUS,” said Stephen. The testing phase lasted about nine months and with its successful completion each base began working on transitioning, which involves an online computer based training, hands on training for the pilot/operations personnel, and removal of paper charts from the aircraft. After training and establishing processes, eight bases are now using EFBs. All other Ameriflight pilots can expect to transition very soon. 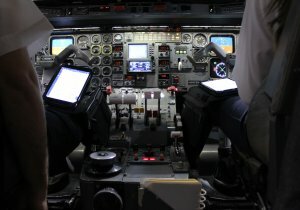 The pilots who have been using the iPads say it has aided their work. “The EFB has changed the way I do my job because it provides such easy access to the charts necessary for my job. It has allowed me to pay more and closer attention to the most important aspect of my job…aviate,” said Steve Denton, PDX, EMB120 Captain. “I believe the EFBs are an integral part of our network, allowing our pilots to perform their duties more safely and efficiently. Not only do they reduce workload, they allow communication and operations between pilots and important data to be more seamless,” said Johnmark James, PDX, BE99 Captain. The initial goal of the EFBs was to eliminate paper charts in Ameriflight aircraft. This goal not only comes with a less cluttered cockpit, but a few other perks as well. “With the EFBs, information can easily be searched and accessed while on the ground and in flight. Pilots have been able to replace their stacks and stacks of paper with one device which, including the kneeboard, is about an inch thick. 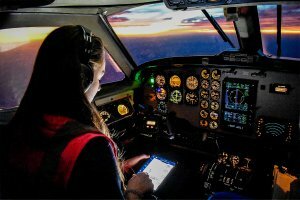 It also has many other functions, including a night mode which reduces eye fatigue and eliminates the need for a second means of illumination such as a flashlight,” explained Peter Dalton, PDX, EMB120 Captain. “The day/night theme and brightly lit displays make reading the charts (especially at night) much easier,” said Steve. “The EFB has allowed me to conduct my flight more safely and efficiently. I am able to access important documents and data without the hassle and volume of paper charts and copies,” said Johnmark. Just like any form of technology, there is a lot of future potential. Ameriflight pilots are looking forward to more apps being added that can do things such as calculate weight and balance, manual utilization, moving maps, and other things to supplement their everyday duties, just to name a few. As for now, Stephen Graham and team are working to get every pilot at every base trained and equipped with an EFB. After that, there are a few plans in place for what pilots can expect next. “Moving forward, we would like to incorporate the new avionics to allow for weather and traffic updates to the iPad. We are also working on Ops Spec a025 which would allow the removal of the paper GOM (General Operating Manual), SOP (Standard Operating Procedures) and MEL (Minimum Equipment List) from the aircraft,” explained Stephen. This transition will not only streamline processes for our pilots but ultimately allow them to focus more on safety and flying. There are a lot of exciting things happening that current and future Ameriflight pilots have to look forward to!